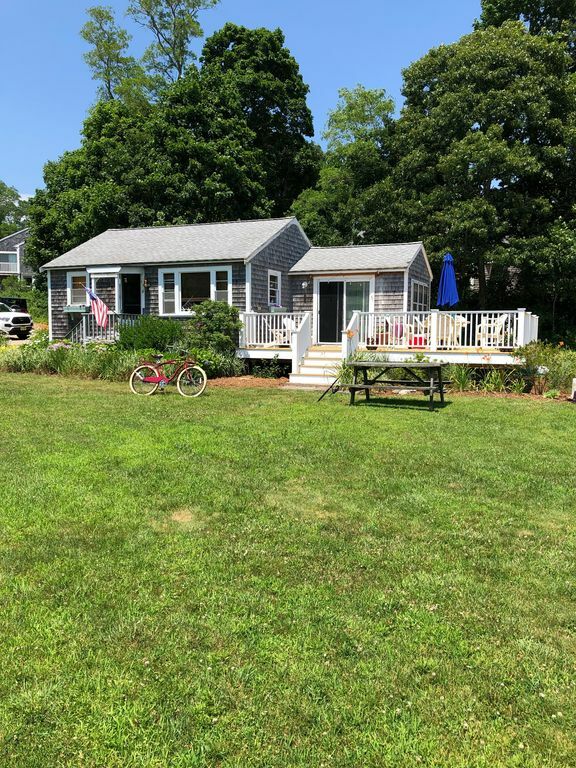 Our charming two bedroom cape cod cottage is nestled on a private culdesac, along with 10 other well maintained homes. The home was updated in fall of 2016 with new flooring and paint throughout the entire home, and addition of an outdoor shower. Our cottage offers 1 master bedroom with a queen size bed, 1 bedroom with a set of full size bunk beds. The Sun Room has one queen size futon that can sleep an extra 2 adults. Kitchen is small, but provides everything you need for preparing meals. Kitchen is fully stocked with all essentials. Sliding glass doors from the Sun Room lead to new large deck with grill and outdoor furniture. Perfect for grilling family dinner while watching the sunset over the water! Large community yard right outside the door, plenty of space for kids to play outside! The neighborhood is located on the cove, providing renters with the ability to access the salt water from right outside their door. Fish and swim from our beautiful dock.You are welcome to use our kayak and stand up paddle board! Dock access is available for those who want to really take advantage of this excellent location and wish to bring a boat, or rent one from the marina down the road. Neighborhood is off of state highway, two minutes drive/short bike ride :), to Orleans town center and Eastham beaches. Orleans town center offers endless amounts of restaurants, cafes, shopping, bike rental, marina, large Stop & Shop and many more. Access to Cape Cod's famous bike path is also available here. You are also welcome to use our two bikes during your stay. I have been vacationing in the Cape since I was in high school. Once I was married with children, it became our family vacation destination every summer. Myself and my entire family loves the cape. Owning a home here has been a dream of mine for a very long time. In 2016, I finally was able to purchase this cape cottage. I look forward to making memories here with my adult children and my grandchildren for many years to come and wish the same for those who choose to stay here. Casual Dining area in the Sun Room. Outside dining table on deck. Picnic table in yard. Great communication with owner. Everything was as stated...Bravo! Perfect location. Water access fantastic. Kayaks available. If you are traveling as a couple or small family and want a central location this might be the place for you! A hideaway neighborhood that gives you an old time cape feeling. Lobster Tails was a small comfortable house that met our needs exactly. Hope to go back soon. We had a great time with our dog, and family of 5! Clean, cozy and on the water!! Can't beat it! We had a wonderful time there. Janet was a great host, always quick to respond. The place was clean, a little tight for a family of 5, but we managed, on the water, the deck is new and big and great for dinners. We went to the beautiful beaches, got dinner, ice cream, mini golf in Orleans, 3 minutes away, fished and swam at the dock at the house. We kayaked, paddle boarded, went go carting. It was a great time. We highly recommend it. I loved the new deck that I learned was just recently added. The sun room and living room were very roomy but the bedrooms were a little tight. That’s ok because you spend most of your time out and about. Everything was close from P-Town to Yarmouth and Hyannis. I loved this little cottage, loved the views and loved loved loved kayaking to the ocean! This cottage was perfect for our needs. The beds were super comfortable so great sleep was had by all, there was plenty of space to hang out on rainy days, the kitchen was supplied with all necessities we needed and WiFi was lightning speed. Also, the shower worked great, plenty of hot water for everyone. We were not able to use the gorgeous deck as much as we would have liked due to cold weather but on nice days it was really nice to sit outside and soak in some sun. The area is really quiet and peaceful, and you can walk out to the dock and enjoy the view. It was a pleasure doing business with Janet, the cottage owner. She responds to messages and questions promptly and all transactions went smoothly, we really couldn't ask for better."